Mac OS X 10.8 Mountain Lion comes pre-loaded with software called 'Gatekeeper', which is designed to help keep malicious software off of your Mac by giving you more control over what you install. But don't worry.. The software we provide is safe. In order to keep the price of our software at a reasonable level, and to provide unlimited updates, we have opt'd not to join Apples Developer Network, and to not have our software included in the AppStore at this time. This gives us the control we need to provide a quality product, and respond to your questions and feature request in a quick timely manner. 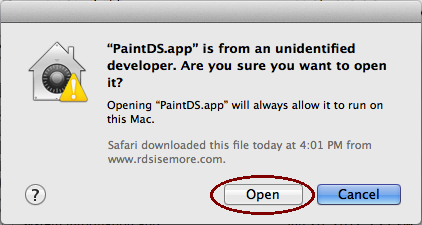 The simplest and easiest way is to control-click (or right-click) the downloaded app to run/install, and on the revealed context menu, choose 'Open.' On the ensuing dialogue box, choose 'Open' as well. Note that this will exempt this file from Gatekeeper, so, if needed, it can be run again by double-clicking. This is the recommended method. Remember, when installing any piece of software, make sure you know exactly what it is and where it came from. Gatekeeper is NOT an anti-virus program. If you bypass Gatekeeper on a malicious download, it may infect your computer. 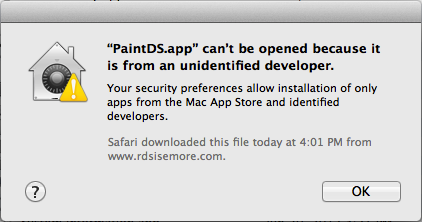 So, always exercise caution when running any new application.